...or Levelized Cost of Electricity, are widely used terms for Agriculture Energies. LCOE is used to compare the relative cost of energy produced by different energy-generating sources, regardless of the project's scale or operating time frame. 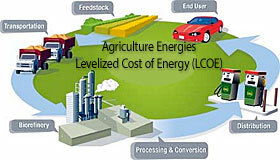 Levelized Cost of Energy LCOE is determined by dividing the Agriculture Energies project's total cost of operation by the energy generated. The total cost of operation should include all costs that the project incurs — including construction and operation — and may incorporate any salvage or residual value at the end of the project's lifetime. Incentives for project construction and energy generation can also be incorporated. As presented in above equation, LCOE Levelized Cost of Energy is a metric that describes the cost of every unit of energy generated by a project in $/kWh (or ¢/kWh or $/MWh). As will be shown directly, this basic definition of the LCOE Levelized Cost of Electricity can be expressed mathematically in more complex ways to account for all of the variables that impact the life cycle cost and total energy production for an Agriculture Energies system. Levelized Cost of Energy (LCOE) is most commonly used for evaluating the cost of energy delivered by projects utilizing different generating technologies. Specifically, it is used to rank options and determine the most cost-effective energy source. LCOE Levelized Cost of Electricity may also be used to compare the cost of energy from new sources to the cost of energy from existing sources. In this context, it is useful to Agriculture Energies clients deciding how future energy needs will be met and which technologies to support, and in selecting technology purchases. It should be noted that energy-efficiency projects may also be evaluated using the metric. Because it captures total operating costs, Levelized Cost of Energy (LCOE) enables comparisons between significantly different technologies, but it may also be used to compare the cost of energy from variations of the same technology. Options related to components or system design can be evaluated to see what impact they have on LCOE Levelized Cost of Electricity. For example, a manufacturer of a new PV module technology that is more efficient, but also more expensive, could use LCOE to determine performance or cost benchmarks that would need to be met in order for the technology to be competitive. Similarly, LCOE could be used to identify areas where cost-savings would be most valuable. While Levelized Cost of Energy LCOE is useful for comparing the cost of energy from multiple technologies or evaluating the differences between sources utilizing the same technology, it should not be the only metric that is considered when doing so. Other financial considerations that play into investment and design decisions span from metrics such as the simple payback period through more-sophisticated systems such as net present value or internal rate of return. Each of these may drive a project in a different direction than an LCOE Levelized Cost of Energy metric. In addition, capital constraints may limit a project to one with a higher LCOE Levelized Cost of Electricity — for example, when a project is built with little up-front cost to the customer. Please call 520-369-AGRI or email if you would like a Levelized Cost of Energy report for your particular application.